Publish your page to the custom domain, and edit or remove the domain anytime. 1. Hover over the page you want to use the domain on. 2. Click on the ellipsis on the top right to access the page actions. 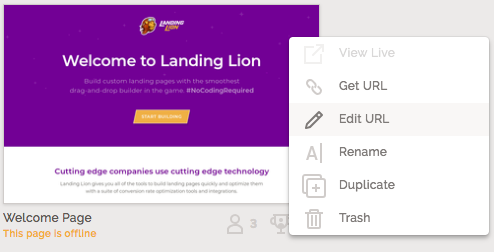 In the page actions dropdown, click "Edit Page URL"
3. In the modal that pops up, select your verified domain in the dropdown. You can add a page slug in the URL input field or leave it blank. 4. Click "Save" to finish. You can change your domain by repeating the steps above, and edit your URL anytime by changing the page slug located in the URL input field to the right of the domain. 🚨 IMPORTANT: You will not be able to remove the custom domain if any active pages are published to it. You'll need to make sure the domain is not being used on any active or inactive pages. 1. Switch the URL of the page the custom domain connected to. 2. Go to your Domain Settings and hover to the right of the domain. Click the trash can icon that appears to remove it.